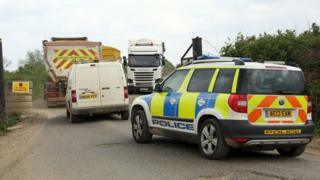 The identity of a severed head found in a Cambridgeshire quarry is set to remain a mystery after police formally closed their investigation. The grizzly discovery was made by a quarry worker at Mepal on 16 May 2016. Forensic experts identified the head as that of a man aged 30 to 50, who could have died as long ago as the 1960s. Despite an extensive investigation it is still not known who he was, but police said there was no evidence to link him to any past criminal cases. The discovery of the head led to a protracted search to identify who it might be, how they died and how the disembodied head came to end up in the Fens. The National Crime Agency's DNA database failed to come up with a match for the remains. Specialists from the Natural History Museum and a forensic odontologist (forensic dentist) also tried to identify the remains from the Block Fen Drove site. Where he came from, and how he ended up at the quarry and landfill site is not know, but police believe the man may have been hit by a train in Bedfordshire in "a tragic accident". "We believe the head may have been lodged somewhere along the structure of the bridge in Sharnbrook, and as part of the recent cleaning process has been dislodged, found its way into the skip and deposited at the quarry in Mepal," Det Insp Jerry Waite said in June 2016. Detectives said the man might have died as long ago as the 1960s, but it was "more likely" his death occurred "about 10 years ago". With no leads, Cambridgeshire Police confirmed the case had been "closed", but would reopen if more information came to light. "We have utilised every opportunity available to us to try and identify this person but sadly at this stage their identity remains a mystery," a spokeswoman said.